Rusty Axe Games, a developer and publisher of downloadable game software located in Terrace, BC, is proud to announce the release of Big$hot! Big$hot is an exciting new financial strategy game about buying and developing business properties from the team that brought you Real E$tate Empire. In Big$hot you play the role of an entrepreneur whose job is to build a portfolio of properties that can be leveraged into a business empire. Big$hot is easy to learn how to play with a complete tutorial system, context sensitive help and an online Q&A system that can be launched from within the game. What to hold, what to fix, what to package up and deal off – it’s all about risk and reward as you try to build your property monopolies and acquire strategic businesses that will help you build and promote your burgeoning business empire. Build monopolies to reduce costs and increase profits. Drive down repair and improvement costs by picking up construction companies. Reduce advertising costs by owning media companies. Control a realty business to fast track sales of your own businesses. Today Ubisoft announced it will release exciting new downloadable content (DLC) for Far Cry® 2, which was developed by Ubisoft Montreal. The Fortune’s Pack DLC will bring new vehicles and new weapons to both the single-player game and the multiplayer game, giving gamers even more diverse means of destruction. Be the silent stalker armed with your silent shotgun or jump on your new quad and blast through the dunes of Africa. 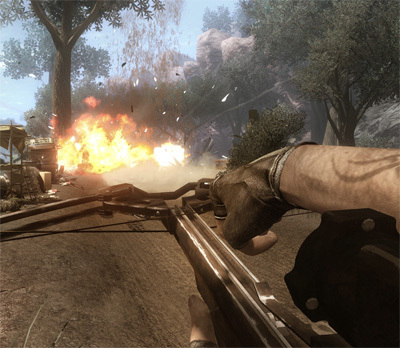 The Fortune’s Pack DLC for Far Cry 2 will be available for download from Xbox LIVE® Marketplace for the Xbox 360® video game and entertainment system from Microsoft and from PlayStation®Network.